Butterfly / Butterflies are the big thing this year I have 3 different types of gobos (at the moment) they range from a very large single Butterfly to groups of Butterflies. The picture on the right shows a group of small butterflies in the red hall hotel during their open evening with purple lights as a backdrop. 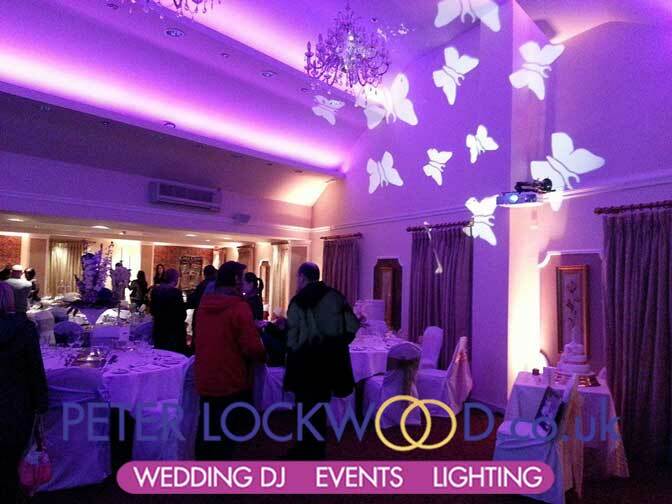 Five Butterflies gobo was used for the Image projection in the lovely Tilden Suite at Shrigley Hall Hotel, Cheshire. Note how clear the images are with the sunlight coming through the windows. I have 6 different types of lights that can project a Butterfly Image where ever you would want one to flutter. The big butterfly image does need a large flat space to look its best, the small one can fit in anywhere.